We've all been told that an "apple a day keeps the doctor away," but what about pineapple? I tried a delicious Glowing Green Smoothie from Whole Foods last week that not only put a pep in my step in a jiffy, but really got me hooked on Pineapple. Pineapple seems to be a staple summer and tropical fruit, and yet I've never been a huge pineapple person. But recently, I've been craving it! Perhaps it's the potassium (just one of the healthy minerals found in pineapple) from all my extra classes I've picked up... 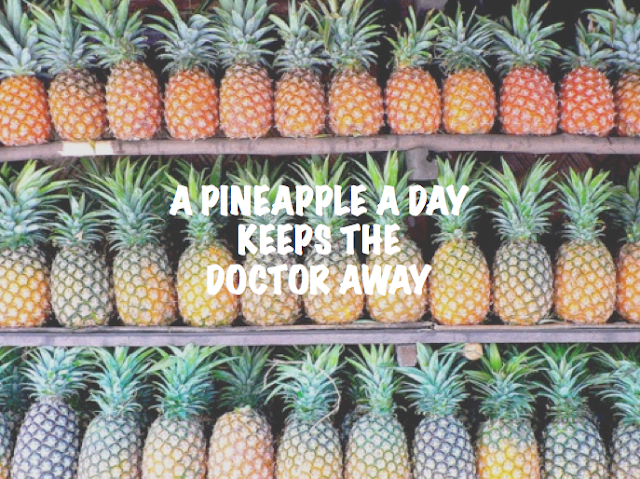 Turns out, there's a whole lotta reasons to love pineapple! Digestive aid & Anti-Inflammatory: Bromelain (found in the core and stems) helps break down proteins, heals bruises and can alleviate arthritis pain. Immunity: Vitamin C, a natural antioxidant, boosts the immune system and helps heal tissue and wounds. Energy: Vitamin B6 helps convert carbohydrates into energy and helps to stabilize blood sugar levels. Electrolyte Balance: Potassium promotes kidney function, and helps with electrolyte balance, which can relieve muscle cramps and soreness.